What saintly film characters have you seen and recommend to others? Tell us, and read what others recommend. 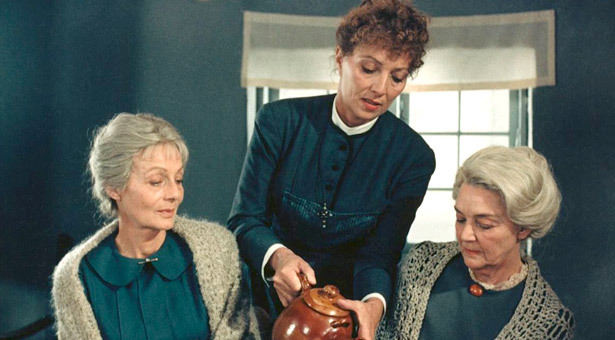 In Babette’s Feast, a French chef helps her neighbors discover the joy of God’s blessings. Photo courtesy of Astrablu. As noted in “Heroes and Saints,” an article in the Winter 2013 issue of Response, Xavier Beauvois’ 2011 film Of Gods and Men is a rarity. It’s a film about faithful Christians who serve their community with Christ-like humility and courage, and it has won worldwide acclaim and film-festival awards. We can find many examples of big-screen characters who give credit to God as they march bravely into war or heroics. We can find “Christian films” about people who, facing hardship, give their lives to God and end up getting their prayers answered or watching their dreams come true. But films about saints — characters who serve in humility, without glory or wish-fulfillment rewards — are harder to come by. They’re out there, though, and some of them are worth seeking out. Sometimes, cinema’s saints appear as servants who follow Christ to a sacrifice. Sometimes they appear as “holy fools,” characters who behave in strange and hilarious ways, giving us funhouse-mirror reflections of the Kingdom of God. Peter Weir is a director with a particular interest in figures who strive against forces of conformity and dehumanization. Sometimes they are misguided dreamers (The Mosquito Coast ); sometimes they are inspiring rebels (Dead Poets Society ); and sometimes they are ordinary people who suddenly wake up to the lies and charades of the world around them (The Truman Show ). But in every case, there is something saintly in their visions, even if they sometimes stray into madness. In Fearless , a plane crash survivor (Jeff Bridges) returns to his family and his routines with a newfound sense of invincibility and faith. This grants him insights on the madness of materialism and the ways in which so many of us go through life without really seeing and appreciating it. On the other hand, his sense of being “above it all” endangers his relationships. His family’s future depends on his willingness to return to the limitations that come with responsibility. Sometimes, it takes a child’s conscience to humble the proud and break hard hearts open. In Danny Boyle’s film Millions , two young boys discover a misplaced fortune. Their differing ideas about what to do with the money divide them, but the youngest becomes a shining light in his community, guided by the voices of saints. Can an animal be saintly? Consider the longsuffering donkey in Robert Bresson’s 1966 feature Au Hasard Balthazar (Or, By Chance, Balthazar). As the donkey silently soldiers on through a hard life of labor, his experiences prompt us to recall Scriptural references to selfless service. Sometimes he is blessed with tenderness; sometimes he suffers grievous abuse. The film lasts as an affecting portrait of humility that brings the strengths and weaknesses of the human beings around him into sharp relief. Three of the most memorable and cherished films about saintly characters have come from Denmark. Perhaps the most celebrated cinematic artist when it comes to saintly portraits is Danish filmmaker Carl Theodor Dreyer. His 1926 film The Passion of Joan of Arc is a silent-film depiction of the trial and execution of the Maid of Orleans. It can be an excruciating experience for viewers, as all of its aspects — the gargoyle-like faces of Joan’s accusers, the heartlessness of their interrogation (the questions are drawn from the actual court documents), the jarring rhythms of its editing, the vertiginous compositions of its stark images — draw viewers into a sense of severe oppression. By contrast, close-ups of Joan’s trance-like reverie give us an unsettling sense that she sees more in heaven and earth than we can. Maria Falconetti’s performance is a raw, harrowing reflection of Christ’s own suffering. Much later, in 1955, Dreyer directed Ordet (The Word ), which is also internationally celebrated as a classic. It’s a love story: Farmer Borgen’s son asks to marry the daughter of Peter the Tailor. It’s also the story of a family feud: The proposal intensifies a long-running theological feud between the families’ patriarchs. (Borgen is a traditional Lutheran, but the tailor is a fundamentalist.) Above all, it is a story about faith and doubt: The conflict is aggravated by Borgen’s middle son — Johannes — who walks about in a trance, crooning dire prophecies and claiming to be Jesus himself. (He’s said to have had a mental breakdown from studying too much Kierkegaard.) When tragedy strikes, the stage is set for a powerful transformation of hardened hearts. Few of these films can boast of box office success. They are not driven by their characters’ charisma or bravado, and they deny us the visceral pleasures of justice achieved through violence. Instead, they have a spirit that seems to transcend generations, telling stories that may seem like madness for those who do not understand or embrace the sacrifice of Christ. They reflect the truth of “this present darkness” even as they point toward the hope of a redemption that is still being fulfilled, for those who look with eyes of faith. What saintly characters have you seen in film? Tell us here, and read what others have to say about on this moderated bulletin board.